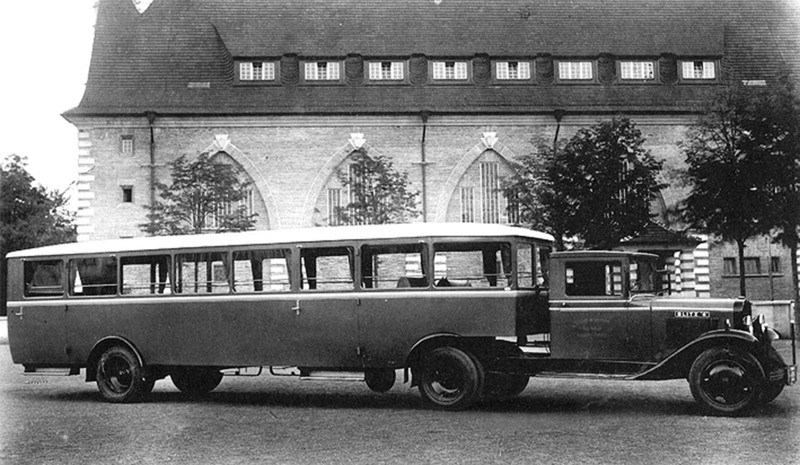 Circa 1930 the call for larger busses and the tax-law's that where on the weight of the tractor where a starting point for ever bigger busses based on it. In the 1920-1930 era there where many companies that build combination car's and truck's to convert between passengers and cargo. Besides taxes, it is a logical development to use semi-trailers. A truck can usually pull twice what it can carry. The truck needs more service and is the more likely component to break down. One spare truck can replace the truck part of many busses. 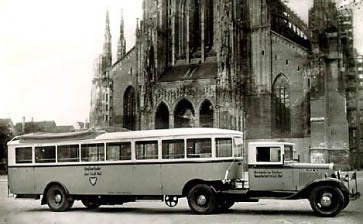 In building semi-trailer busses Kässbohrer of Ulm was the leading company. 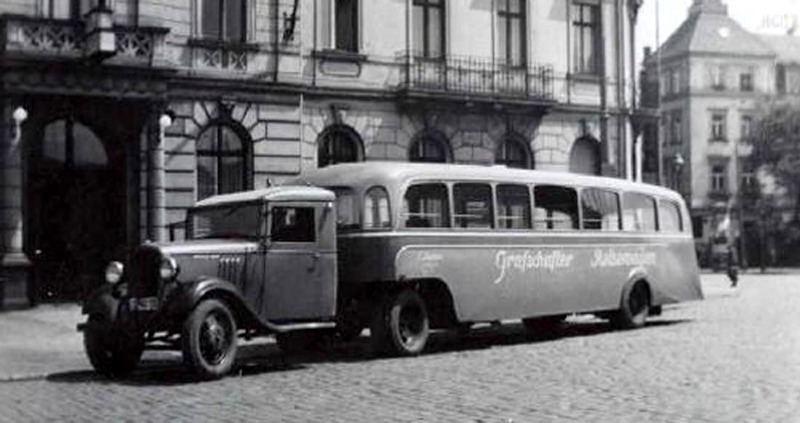 At the model change of 1937, Opel tractors where also used for semi-trailer busses. 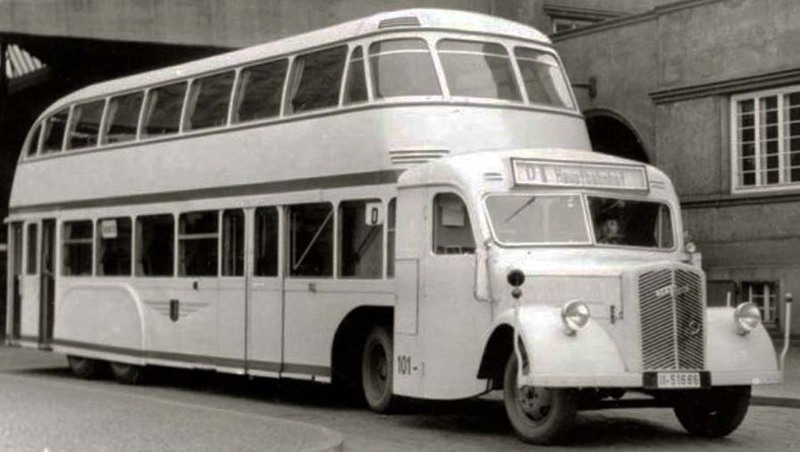 Leipzig and Dresden used them, Replacement of the heavy Berlin doubledeckers was attempted after the war. 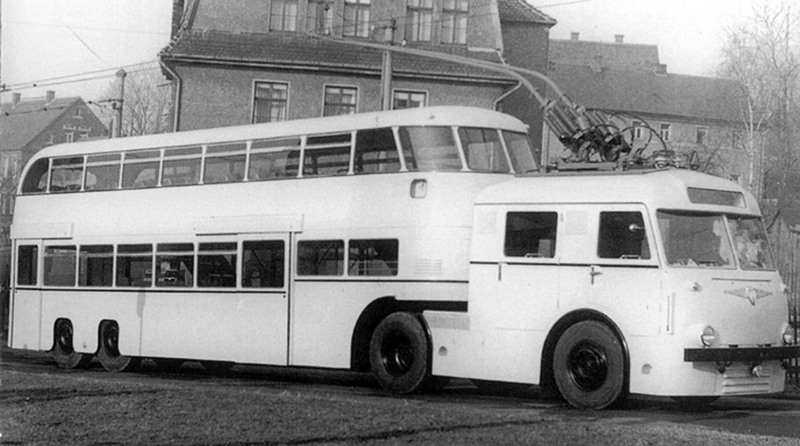 The roof lay-out of the Dessauer Mercedes bus is very revealing of the construction of all. The pioneer situation seems to be Leipzig community transport. Speed of the combination is limited to 45 km/h. This must be from the Schumann company and by the logo on the trailer and the layout of both also from Leipzig. 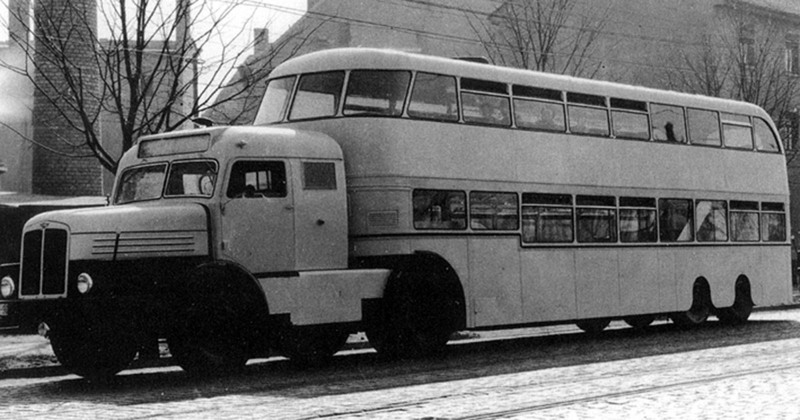 In replacing streetcars and much heavier busses it seems an adequat solution. 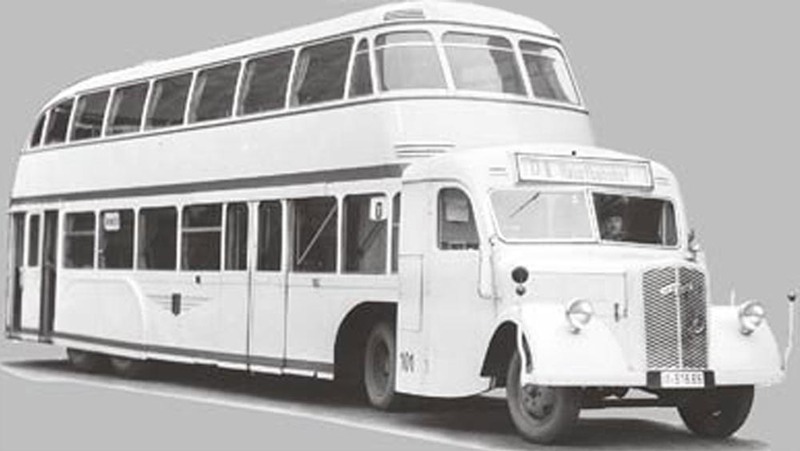 Double decker's where also on buschassis, as the where operated in Berlin, but on much heavier chassis. Same picture, but reworked. (background cut out) but with more details In 1952 reportetly 7 new combinations are build. They show remarkable simularity with the post war trailers. 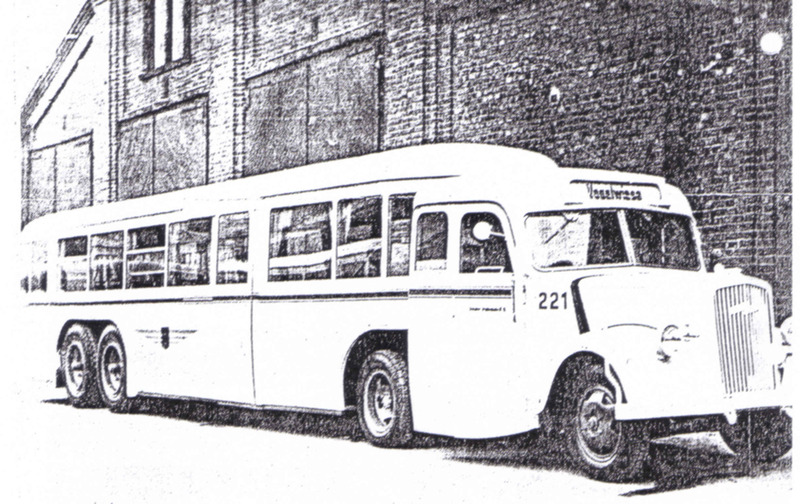 In 1955 a prototype is made for a electrically driven tractor unit. The trailer information is reportetly the 1939 version. Trailers ares seen with and without the "radverkleiding", the wheelcover. Compare the post war pictures. In day to day maintainance the probably where trouble. A big Mercedes Benz tractor pulls a giant semitrailer bus revealing the roof layout. A side not often seen. 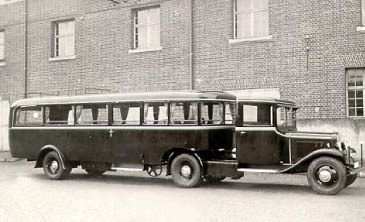 This layout with a part roof opening with a sliding motion to the rear is seen on many period busses.